The West New Guinea dispute (1950–1962), also known as the West Irian dispute, was a diplomatic and political conflict between the Netherlands and Indonesia over the territory of Netherlands New Guinea. While the Netherlands had ceded sovereignty to Indonesia on 27 December 1949 following an independence struggle, the Indonesian government had always claimed the Dutch-controlled half of New Guinea on the basis that it had belonged to the Dutch East Indies and that the new Republic of Indonesia was the legitimate successor to the former Dutch colony. During the first phase of the West Irian dispute (1950–1954), Indonesia pursued bilateral negotiations with the Netherlands. During the second phase (1954–1958), Indonesia attempted to raise support for its territorial claims in the United Nations General Assembly. During the third phase (1960–1962), Indonesia pursued a policy of confrontation against the Netherlands which combined diplomatic, political, and economic pressure with limited military force. The final stage of the confrontation with Indonesia also involved a planned military invasion of the territory. The Indonesians also secured military weapons and political and military support from the Soviet Union, which induced the United States to intervene in the conflict as a third-party mediator between Indonesia and the Netherlands. Following the New York Agreement on 15 August 1962, the Netherlands, under American pressure, handed West New Guinea over to a United Nations Temporary Executive Authority, which subsequently handed the territory over to Indonesia on 1 May 1963. Following a controversial plebiscite in 1969, West New Guinea was formally integrated into Indonesia. Prior to the arrival of the Dutch, two Indonesian principalities known as the Sultanate of Tidore and the Sultanate of Ternate claimed suzerainty over Western New Guinea. The island territory was viewed by these sultanates as a source of spices, bird of paradise feathers, resins, and Papuan slaves. In 1828, the Netherlands established a settlement in Western New Guinea and also proclaimed sovereignty over the part of the island lying west of 141 degrees longitude. Dutch activity in New Guinea was minimal until 1898 when the Dutch established an administrative centre, which was subsequently followed by missionaries and traders. Under Dutch rule, commercial links were developed between West New Guinea and Eastern Indonesia. In 1883, New Guinea was divided between the Netherlands, Britain, and Germany; with Australia occupying the German territory in 1914. In 1901, the Netherlands formally purchased West New Guinea from the Sultanate of Tidore, incorporating it into the Netherlands East Indies. During World War Two, Western New Guinea was occupied by the Japanese but was later recaptured by the Allies, who restored Dutch rule over the territory. Following the Indonesian National Revolution, the Netherlands formally transferred sovereignty to the United States of Indonesia, the successor state to the Netherlands East Indies, on 27 December 1949. However, the Dutch refused to include Netherlands New Guinea in the new Indonesian Republic and took steps to prepare it for independence as a separate country. Following the failure of the Dutch and Indonesians to resolve their differences over West New Guinea during the Dutch-Indonesian Round Table Conference in late 1949, it was decided that the present status quo of the territory would be maintained and then negotiated bilaterally one year after the date of the transfer of sovereignty. However, both sides were still unable to resolve their differences in 1950, which led the Indonesian President Sukarno to accuse the Dutch of reneging on their promises to negotiate the handover of the territory. On 17 August 1950, Sukarno dissolved the United States of Indonesia and proclaimed a unitary Republic of Indonesia. The Dutch argued that the territory did not belong to Indonesia because the Melanesian Papuans were ethnically and geographically different from Indonesians, had always been administrated separately, did not participate in the Indonesian Revolution, and that the Papuans did not want to be under Indonesian control. According to the Dutch political scientist Arend Lijphart, other underlying Dutch motives included West New Guinea's lucrative economic resources, its strategic importance as a Dutch naval base, and its potential role for housing the Netherlands' surplus population including Eurasians who had become displaced by the Indonesian Revolution. The Dutch also wanted to maintain a regional presence and to secure their economic interests in Indonesia. Meanwhile, the Indonesians regarded West New Guinea as an intrinsic part of Indonesia on the basis that Indonesia was the successor government to the Netherlands East Indies. These sentiments were reflected in the popular Indonesian revolutionary slogan "Indonesia Free—from Sabang to Merauke. Indonesian irredentist sentiments were also inflamed by the fact that several Indonesian political prisoners had been interned at a remote prison camp north of Merauke called Boven-Digoel prior to World War II. Sukarno also contended that the continuing Dutch presence in West New Guinea was an obstacle to the process of nation-building in Indonesia and that it would also encourage secessionist movements. Graffiti against the presence of the Netherlands in West Irian. Between 1950 and 1953, the Netherlands and Indonesia tried to resolve dispute through bilateral negotiations. These negotiations were unsuccessful and led the two governments to harden their position. On 15 February 1952, the Dutch Parliament voted to incorporate New Guinea into the realm of the Netherlands. After that, the Netherlands refused further discussion on the question of sovereignty and considered the issue to be closed. In response, President Sukarno adopted a more forceful stance towards the Dutch. Initially, he unsuccessfully tried to force the Indonesian government to abrogate the Round Table agreements and to adopt economic sanctions but was rebuffed by the Natsir Cabinet. Undeterred by this setback, Sukarno made recovering West Irian an important priority of his presidency and sought to harness popular support from the Indonesian public for this goal throughout many of his speeches between 1951 and 1952. By 1953, the West Irian dispute had become the central issue in Indonesian domestic politics. All political parties across the Indonesian political spectrum, particularly the Indonesian Communist Party (PKI), supported Sukarno's efforts to integrate West Irian into the Indonesian Republic. According to the historians Audrey and George McTurnan Kahin, the PKI's pro-integration stance helped the party to rebuild its political base and to further its credentials as a nationalist Communist Party that supported Sukarno. At the urging of President Sukarno, Prime Minister Ali Sastroamidjojo began authorising limited incursions into West New Guinea in 1952. However, these early incursions were militarily unsuccessful and Indonesia did not launch any more military operations until 1960. According to Ken Conboy the first incursions were 'amateurish', the first infiltration of Gag Island in 1952 led to the arrest of the infiltrators within days. A second infiltration attempt one year later in 1953, this time directed at Kaimana, in like manner was promptly contained and the infiltrators arrested. A third infiltration attempt in 1954 was a more serious affair, a well armed party of 42 infiltrators were able to abduct the Dutch police officer Sergeant van Krieken back to Indonesian territory. The infiltration force was engaged by Dutch marines, resulting in eleven Indonesian casualties and the capture of the remaining Indonesian forces. Due to the failure of these armed incursions the Indonesian government reluctantly accepted it could not mount a credible military challenge against the Dutch in West New Guinea and it was not until 1960 that Indonesia would again test the Dutch military position in West New Guinea. In 1954, Indonesia decided to take the West New Guinea dispute to the United Nations and succeeded in having it placed on the agenda for the upcoming ninth session of the United Nations General Assembly (UNGA). In response, the Dutch Ambassador to the United Nations, Herman van Roijen, warned that the Netherlands would ignore any recommendations which might be made by the UN regarding the West Irian dispute. During the Bandung Conference in April 1955, Indonesia succeeded in securing a resolution supporting its claim to West New Guinea from the Afro-Asian countries. Besides the Afro-Asian countries, Indonesia was also supported by the Soviet Union and its Warsaw Pact allies. Meanwhile, the Netherlands' stance on Western New Guinea was supported by the United States, the United Kingdom, Australia, New Zealand, and several Western European and Latin American countries. However, these countries were unwilling to commit to providing military support to the Netherlands in the event of a conflict with Indonesia. The Eisenhower Administration were open to non-violent territorial changes but rejected the use of any military means to resolve the West Irian dispute. Until 1961, the United States pursued a policy of strict neutrality and abstained on every vote on the dispute. According to the historian Nicholas Tarling, the United Kingdom government took the position that it was "strategically undesirable" for control of the territory to pass to Indonesia because it created a precedent for encouraging territorial changes base on political prestige and geographical proximity. The Australian Menzies Government welcomed the Dutch presence in West New Guinea as an "essential link" in its national defence since it also administrated a trust territory in the eastern half of New Guinea. Unlike its Labor Party successor which had supported the Indonesian nationalists, the Prime Minister Robert Menzies viewed Indonesia as a potential threat to its national security and distrusted the Indonesian leadership for supporting the Japanese during World War II. In addition, the New Zealand and South African governments also opposed the Indonesian claim to West New Guinea.The New Zealand government accepted the Dutch argument that the Papuans were culturally different from the Indonesians and thus supported maintaining Dutch sovereignty over the territory until the Papuans were ready for self-rule. By contrast, newly independent India, another Commonwealth member supported Indonesia's claim to West New Guinea. Between 1954 and 1957, the Indonesians and their Afro-Asian allies made three attempts to get the United Nations to intervene in the West New Guinea dispute. However, all these three resolutions failed to gain a two–thirds majority in the United Nations General Assembly. On 30 November 1954, the Indian representative Krishna Menon initiated a resolution calling for the Indonesians and Dutch to resume negotiations and to report to the 10th UNGA Session. This resolution was sponsored by eight countries (Argentina, Costa Rica, Cuba, Ecuador, El Salvador, India, Syria, and Yugoslavia) but failed to secure a two-thirds majority (34-23-3). In response to growing tensions between Jakarta and the Hague, the Indonesian government unilaterally dissolved the Netherlands-Indonesian Union on 13 February 1956, and also rescinded compensation claims to the Dutch. Undeterred by this setback, the Indonesians resubmitted the West New Guinea issue to the UNGA's agenda in November 1965. 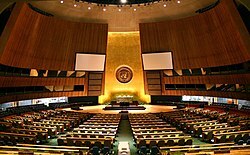 On 23 February 1957, a thirteen country–sponsored resolution (Bolivia, Burma, Ceylon, Costa Rica, Ecuador, India, Iraq, Pakistan, Saudi Arabia, Sudan, Syria, and Yugoslavia) calling for the United Nations to appoint a "good offices commission" for West New Guinea was submitted to the UN General Assembly. Despite receiving a plural majority (40-25-13), this second resolution failed to gain a two-thirds majority. Undeterred, the Afro-Asian caucus in the United Nations lobbied for the West New Guinea dispute to be included on the UNGA's agenda. On 4 October 1957, the Indonesian Foreign Minister Subandrio warned that Indonesia would embark on "another cause" if the United Nations failed to bring about a solution to the dispute that favoured Indonesia. That month, the Indonesian Communist Party and affiliated trade unions lobbied for retaliatory economic measures against the Dutch. On 26 November 1957, a third Indonesian resolution on the West New Guinea dispute was put to the vote but failed to gain a two-thirds majority (41-29-11). In response, Indonesia took retaliatory measure against Dutch interests in Indonesia. Following the defeat of the third Afro-Asian resolution in November 1957, the Indonesian government embarked on a national campaign targeting Dutch interests in Indonesia; leading to the withdrawal of the Dutch flag carrier KLM's landing rights, mass demonstrations, and the seizure of the Dutch shipping line Koninklijke Paketvaart-Maatschappij (KPM), Dutch-owned banks, and other estates. By January 1958, ten thousand Dutch nationals had left Indonesia, many returning to the Netherlands. This spontaneous nationalisation had adverse repercussions on the Indonesian economy, disrupting communications and affecting the production of exports. President Sukarno also abandoned efforts to raise the West New Guinea dispute at the 1958 United Nations General Assembly, claiming that reason and persuasion had failed. Following a sustained period of harassment against Dutch diplomatic representatives in Jakarta, the Indonesian government formally severed relations with the Netherlands in August 1960. In response to Indonesian aggression, the Netherlands government stepped up its efforts to prepare the Papuan people for self-determination in 1959. These efforts culminated in the establishment of a hospital in Hollandia (modern–day Jayapura), a shipyard in Manokwari, agricultural research sites, plantations, and a military force known as the Papuan Volunteer Corps. By 1960, a legislative New Guinea Council had been established with a mixture of legislative, advisory and policy functions had been established. Half of its members were to be elected and elections for this council were held the following year. Most importantly, the Dutch also sought to create a sense of West Papuan national identity and these efforts led to the creation of a national flag (the Morning Star flag), a national anthem, and a coat of arms. The Dutch had planned to transfer independence to West New Guinea in 1970. Joseph Luns, the Dutch Foreign Minister at the time. By 1960, other countries in the Asia-Pacific region had taken notice of the West Irian dispute and began proposing initiatives to end the dispute. During a visit to the Netherlands, the New Zealand Prime Minister Walter Nash suggested the idea of a united New Guinea state, consisting of both Dutch and Australian territories. This idea received little support from both the Indonesians and other Western governments. Later that year, the Malayan Prime Minister Tunku Abdul Rahman proposed a three-step initiative, which involved West New Guinea coming under United Nations trusteeship. The joint administrators would be three non-aligned nations Ceylon, India, and Malaya, which supported Indonesia's position on West Irian. This solution involved the two belligerents, Indonesia and the Netherlands, re-establishing bilateral relations and the return of Dutch assets and investments to their owners. However, this initiative was scuttled in April 1961 due to opposition from the Indonesian Foreign Minister Subandrio, who publicly attacked the Tunku's proposal. By 1961, the Netherlands government was struggling to find adequate international support for its policy to prepare West New Guinea for independent status under Dutch guidance. While the Netherlands' traditional Western allies—the United States, Great Britain, Australia, and New Zealand—were sympathetic to Dutch policy, they were unwilling to provide any military support in the event of conflict with Indonesia. On 26 September 1961, the Dutch Foreign Minister Joseph Luns offered to hand over West New Guinea to a United Nations trusteeship. This proposal was firmly rejected by his Indonesian counterpart Subandrio, who likened the West New Guinea dispute to Katanga's attempted secession from the Republic of Congo during the Congo Crisis. By October 1961, Britain was open to transferring West New Guinea to Indonesia while the United States floated the idea of a jointly-administered trusteeship over the territory. On 23 November 1961, the Indian delegation at the United Nations presented a draft resolution calling for the resumption of Dutch–Indonesian talks on terms which favoured Indonesia. On 25 November 1961,several Francophone African countries tabled a rival resolution which favoured an independent West New Guinea. The Indonesians favoured the Indian resolution while the Dutch, Britain, Australia, and New Zealand supported the Francophone African resolution. On 27 November 1961, both the Francophone African (52-41-9) and Indian (41-40-21) resolutions were put to the vote failed to gain a two–thirds majority at the United Nations General Assembly. The failure of this final round of diplomacy in the UN convinced the Indonesians to prepare for a military invasion of West Irian. Indonesia invested in substantial amounts of Soviet military hardware, including this MiG-21 fighter jet. As the West New Guinea dispute began to escalate, Sukarno also developed closer relations with the Soviet Union, which shared Indonesia's colonial outlook. In July 1959, the Indonesian government adopted a policy of Confrontation (Konfrontasi) against the Dutch. According to the Indonesian political scientist J. Soedjati Djiwandono, Indonesia's Confrontation policy involved the use of political, economic, and military force to induce an opponent to reach a diplomatic solution on Indonesian terms. Later that year, the Soviet government decided to supply warships and other military hardware directly to the Indonesians. By 1965, the Indonesian Navy had grown to 103 combat vessels and other auxiliaries (including a cruiser, twelve submarines, and sixteen destroyers and frigates). Due to Soviet military aid, the Indonesian Navy became the second most potent force in East Asia after China. The Indonesian Air Force also benefited from an infusion of Soviet military hardware and training, developing a long-range capability. Bolstered by Soviet military weapons and equipment, Indonesia had begun to reconsider the viability of renewing military operations against Dutch forces in West New Guinea. On 9 November 1960, Indonesia launched a seaborne incursion into the territory but this operation proved to be a failure. Of the twenty-three infiltrators, seven were killed and the remaining sixteen were captured within four months. On 14 September 1961 a new infiltration attempt was launched, but once again the infiltration party was promptly intercepted and defeated by Dutch forces. Following the failure of diplomacy in the United Nations and persisted Dutch efforts to prepare the West Papuans for self-rule, Indonesia's Confrontation against the Dutch in West New Guinea reached a new crescendo. On 19 December 1961, President Sukarno gave orders for the Indonesian military to prepare for a full–scale military invasion of the territory; codenamed Operation Trikora. He also ordered the creation of a special People's Triple Command or Tri Komando Rakyat (Trikora) with the objective of 'liberating' West New Guinea by 1 January 1963. Trikora's operational command was to be called the Mandala Command for the Liberation of West Irian (Komando Mandala Pembebasan Irian Barat) and was led by Major-General Suharto, the future President of Indonesia. In preparation for the planned invasion, the Mandala command began making land, air, and sea incursions into West Irian. General Suharto also planned to launch a full-scale amphibious operation invasion of West Irian known as Operation Jayawijaya (or Operation Djajawidjaja). In response to Indonesian aggression, the Netherlands increased its military presence and intelligence-gathering efforts in West New Guinea. Since 15 April 1954, the Royal Netherlands Navy had been responsible for the territorial defence of West New Guinea. A signals intelligence agency known as Marid 6 Netherlands New Guinea (NNG) was also established in April 1955 to provide the Netherlands New Guinea authorities with intelligence on Indonesian intentions towards West Irian. One of Marid 6 NNG's successes was providing early warning of Indonesian plans to seize all KPM ships and facilities in December 1957. This enabled the Dutch authorities to evacuate 45 of these 83 ships. Later, Marid 6 NNG helped Dutch naval units to recapture the KPM ships. In 1962, the Royal Netherlands Navy deployed a sizeable naval task group including the aircraft carrier HNLMS Karel Doorman to West New Guinea. On 15 January 1962, the Indonesian Navy attempted to land a force of 150 marines near Vlakke Hoek, on West Irian's south coast. The Indonesians had intended to raise the Indonesian flag on Dutch territory to weaken the Netherlands position during the ongoing negotiations in New York. However, Marid 6 NNG managed to intercept Indonesian radio messages and learned about the Indonesian plans. In response, the Dutch authorities deployed a Lockheed Neptune patrol aircraft and three destroyers to intercept the three Indonesian motor torpedo-boats (the fourth boat had experienced engine trouble and did not participate). During the ensuing Vlakke Hoek incident, one of the Indonesian torpedo boats was sunk, while the remaining two boats were forced to retreat. The operation ended disastrously for the Indonesians, with many crew members and embarked marines being killed and 55 survivors taken prisoner. Among the casualties was Commodore Yos Sudarso, the deputy chief of the Indonesian Navy Staff. On 24 June 1962, four Indonesian Air Force C-130 Hercules jets dropped 213 paratroopers near Merauke. Throughout the year, a total of 1,200 Indonesian paratroopers and 340 naval infiltrators landed in West New Guinea. By mid-1962, the Indonesian military had begun preparations to launch Operation Jayawijaya around August 1962. This operation was to be carried out in four phases and would have involved joint air and naval strikes against Dutch airfields, paratroop and amphibious landings at Biak and Sentani, and a ground assault on the territory's capital Hollandia. Unknown to the Indonesians, Marid 6 NNG had intercepted Indonesian transmissions and obtained intelligence on Indonesian battle plans. However, a ceasefire agreement known as the New York Agreement, which facilitated the transfer of West New Guinea to Indonesia control by 1963, was signed by the Dutch and Indonesians on 15 August 1962. As a result, the Trikora Command cancelled Operation Jayawijaya on 17 August 1962. By 1961, the United States government had become concerned about the Indonesian military's purchase of Soviet weapons and equipment for a planned invasion of West New Guinea. The Kennedy Administration feared an Indonesian drift towards Communism and wanted to court Sukarno away from the Soviet Bloc and Communist China. The United States government also wanted to repair relations with Jakarta, which had deteriorated due to the Eisenhower Administration's covert support for the Permesta/PRRI regional uprisings in Sumatra and Sulawesi. These factors convinced the Kennedy Administration to intervene diplomatically to bring about a peaceful solution to the West New Guinea dispute, which favoured Indonesia. Throughout 1962, the American diplomat Ellsworth Bunker facilitated top–secret high–level negotiations between the Dutch and Indonesian governments. These protracted talks produced a peace settlement known as the New York Agreement on 15 August 1962. As a face-saving measure, the Dutch would hand over West New Guinea to a provisional United Nations Temporary Executive Authority (UNTEA) on 1 October 1962, which then ceded the territory to the Indonesians on 1 May 1963; formally ending the West New Guinea dispute. As part of the New York Agreement, it was stipulated that a popular plebiscite would be held in 1969 to determine whether the Papuans would choose to remain in Indonesia or seek self-determination. While American diplomacy averted the escalation of the West New Guinea dispute into full–blown war between Indonesia and the Netherlands, Washington failed to win over President Sukarno. Buoyed by his success in the West New Guinea campaign, Sukarno turned his attention to the former British colony of Malaysia, resulting in the Indonesian-Malaysian Confrontation which induced a deterioration of Indonesia's relations with the West. 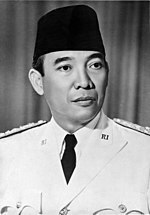 Ultimately, President Sukarno was overthrown during the Indonesian coup attempt of 1965 and subsequently replaced by the pro-Western Suharto. In addition, the American mining company Freeport-McMoRan was interested in exploiting Western New Guinea's copper and gold deposits. Following the Act of Free Choice plebiscite in 1969, Western New Guinea was formally integrated into the Republic of Indonesia. Instead of a referendum of the 816,000 Papuans, only 1,022 Papuan tribal representatives were allowed to vote and all of these were coerced into voting in favour of integration. While several international observers including journalists and diplomats criticised the referendum as being rigged, the United States and Australia support Indonesia's efforts to secure acceptance in the United Nations for the pro-integration vote. That same year, 84 member states voted in favour for the United Nations to accept the result, with 30 others abstaining. Due to the Netherlands' efforts to promote a West Papuan national identity, a significant number of Papuans refused to accept the territory's integration into Indonesia. These formed the separatist Organisasi Papua Merdeka (Free Papua Movement) and have waged an insurgency against the Indonesian authorities, which still continues to this day. Anderson, Benedict (2006) . Imagined Communities: Reflections on the Origin and Spread of Nationalism. London: Verso. Catley, Bob; Dugis, Vinsensio (1998). Australian Indonesian Relations Since 1945: The Garuda and The Kangaroo. Aldershot, England: Ashgate. Crocombe, Ron (2007). Asia in the Pacific Islands. Suva, Fiji: IPS Publications, University of the South Pacific. Djiwandono, Soedjati (1996). Konfrontasi Revisited: Indonesia's Foreign Policy Under Soekarno. Jakarta: Centre for Strategic and International Studies. Green, Michael (2005). "Chapter 6: Uneasy Partners: New Zealand and Indonesia". In Smith, Anthony (ed.). Southeast Asia and New Zealand: A History of Regional and Bilateral Relations. Wellington: Victoria University of Wellington. pp. 145–208. ISBN 978-0-86473-519-5. Ide Anak Agung Gde Agung (1973). Twenty Years Indonesian foreign policy, 1945–1965. The Hague: Mouton. Kahin, Audrey; Kahin, George McTurnan (1995). Subversion as Foreign Policy: The Secret Eisenhower and Dulles Debacle in Indonesia. New York: The New Press. Legge, John D. (2003). Sukarno: A Political Biography. Singapore: Archipelago Press, Editions Didier Millet. ISBN 981 4068 64 0. Lijphart, Arend (1966). The Trauma of Decolonization: The Dutch and West New Guinea. New Haven: Yale University Press. Mackie, Jamie (2005). Bandung 1955: Non-Alignment and Afro-Asian Solidarity. Singapore: Editions Didier Millet. Muraviev, Alexey; Brown, Colin (December 2008). "Strategic Realignment or Déjà vu? Russia-Indonesia Defence Cooperation in the Twenty-First Century". SCDC Working Papers (411): 42. Retrieved 26 May 2014. "Operation Trikora – Indonesia's Takeover of West New Guinea". Pathfinder: Air Power Development Centre Bulletin (150): 1–2. February 2011. Retrieved 19 September 2013. Platje, Wies (2001). "Dutch Sigint and the Conflict with Indonesia 1950–62". Intelligence and National Security. 16 (1): 285–312. doi:10.1080/714002840. Singh, Bilveer (2001). "West Irian and the Suharto Presidency: a perspective". The Act of Free Choice: 73–93. Retrieved 26 May 2014. Tarling, Nicholas (2008). Britain and the West New Guinea Dispute, 1949-1962. Lewiston, New York: Edwin Mellen Press. ^ Bob Catley and Vinsensio Dugis, The Garuda and The Kangaroo, pp.20–21. ^ Soedjati Djiwandono, Konfrontasi Revisited, pp.122–35. ^ Ron Crocombe, Asia in the Pacific Islands, p.284. ^ Ron Crocombe, Asia in the Pacific Islands, p. 282. ^ Audrey and George McTurnan Kahin, Subversion as Foreign Policy, p. 45. ^ a b c "Operation Trikora – Indonesia's Takeover of West New Guinea". Pathfinder: Air Power Development Centre Bulletin (150): 1–2. February 2011. Retrieved 19 September 2013. ^ Benedict Anderson, Imagined Communities, p. 176. ^ Bob Catley and Vinsensio Dugis, The Garuda and The Kangaroo, pp. 20–21. ^ John D. Legge, pp.277-78. ^ John Legge, Sukarno: A Political Biography, pp.277–78. ^ a b Ken Conboy, 'Kopassus: Inside Indonesia's Special Forces', p. 62. ^ Soedjati Djiwandono, Konfrontasi Revisited, p.38. ^ Nicholas Tarling, Britain and the West New Guinea Dispute, pp. 19. ^ Nicholas Tarling, Britain and the West New Guinea Dispute, p. 19. ^ Michael Green, Uneasy Partners, pp. 154–55. ^ Nicolas Tarling, pp. 59-60. ^ Nicholas Tarling, pp. 104-105, 114-115. ^ Nicholas Tarling, Britain and the West New Guinea Dispute, pp. 359-374, 391-97. ^ “West New Guinea,” in “The Month in the United Nations: Sixteenth Session of the General Assembly,” External Affairs Review (New Zealand) XI, no. II (November 1961): pp. 49-50. ^ Nicholas Tarling, Britain and the West New Guinea Dispute, pp. 400-418. ^ Soedjati Djiwandono, Konfrontasi Revisited, pp. ix-x, 125. ^ Alexey Muraviev and Colin Brown, "Strategic Realignment or Deja vu? ", pp.4–5. ^ Ken Conboy, 'Kopassus: Inside Indonesia's Special Forces', p. 63. ^ Ken Conboy, Kopassus: Inside Indonesia's Special Forces, p. 65. ^ Wies Platje, pp. 300–02. ^ Ken Conboy, 'Kopassus: Inside Indonesia's Special Forces', p. 66. ^ Soedjati Djiwandono p. 135. This page was last edited on 30 January 2019, at 18:56 (UTC).